My relationship with MIFA started a long time ago. As December approached in my junior year of high school, my family and friends would ask what I wanted for Christmas. Something about that idea bothered me. I was asking for things I wanted rather than things that I needed. The truth was that I had everything I needed. So when someone asked what I wanted for Christmas, I decided to start small – peace and harmony all over the world. Should be a piece of cake! Initially, my friend Amanda came closest to granting this wish when she presented me with peas and hominy (corn). Yes, Amanda, I still remember the peas and hominy! My church in high school hosted a pre-Christmas dance called Snowball, which was always well attended. This particular year, I was shocked when Santa himself showed up (stag) for the festivities. As I watched, he walked up to the stage, took the microphone and asked for me to come up and join him. Now for those of you who know me, it’s easy to image the brilliant shade of red that spread across my face. Santa told me that my friends had pooled their money together and made a donation to MIFA in my honor. In total there were almost 50 people who contributed and signed their names my giant poster-sized card. 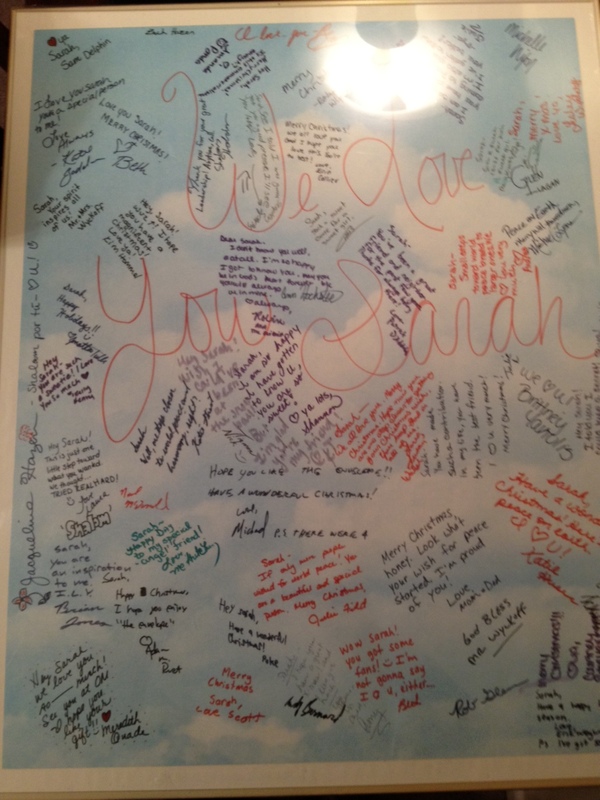 I was overwhelmed by their generosity and thoughtfulness. To this day, I still have difficulty fully describing how meaningful that moment was. So to all of you who helped and donated, thank you! I still have the poster you signed! 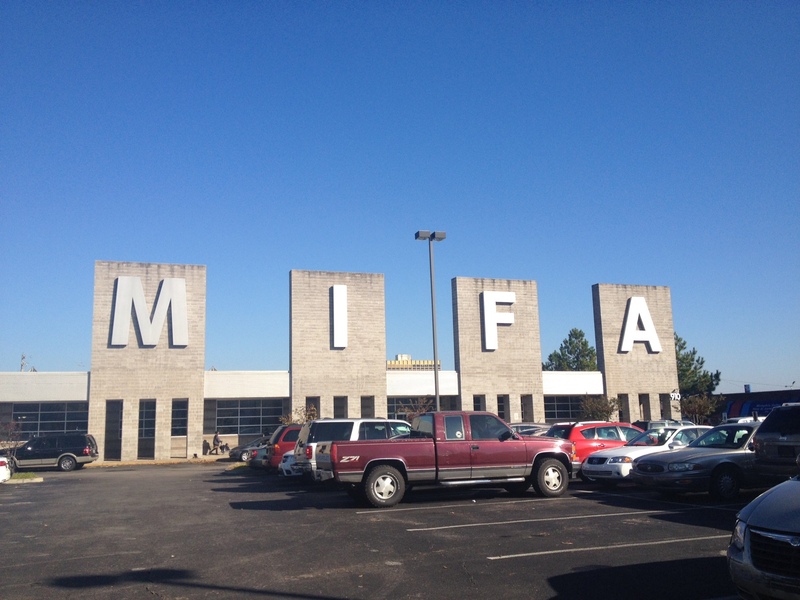 This week, I visited MIFA and I’m happy to report: your money has been put to good use! MIFA’s volunteer coordinator, Charlie Nelson, has the right idea. She told me she wants the volunteers to feel valued and useful. Considering that fact that she gave up her office to get space for a volunteer training room, I think she means it! 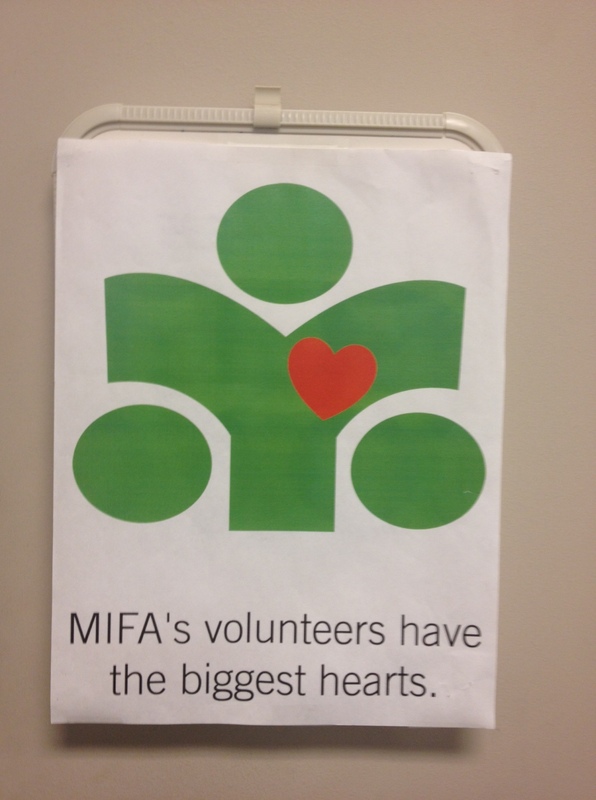 I learned that MIFA has more than 2,700 volunteers and in total, they have donated 135,000 hours of service to MIFA. According to Charlie, it’s this level of dedication and commitment that enables them to keep overhead low and effectively operate their programs focused on hunger and homelessness. When I asked her about their biggest need for volunteers, I was surprised to learn that Meals on Wheels is in desperate need of people to deliver food across this city. I suppose this surprised me for several reasons: it’s a well-known program and frankly, it’s fun! Here’s where you get to meet the second Charlie of the day! Charlie McCrary has been delivering meals on Tuesdays and Thursdays for two years now and I was lucky enough to have the opportunity to ride with Charlie on his route that day. “Come with me!” he said cheerfully. He gathered the meals for his deliveries and I followed him out to his car – a hybrid with a Wolf River Conservancy sticker on the back bumper. “Charlie, you’re full of surprises,” I told him. “You think so?” he asked. We loaded up the car and drove out to a section of North Memphis I’d never seen before. As we tracked down each house, Charlie mentioned that many of them are easy to spot because of the new ramps (another service of MIFA). Sure enough, we pulled up to a house with a brand new ramp out front. As we walked up to the door it swung open and a young woman profusely thanked her for dropping off lunch for her mother. We followed our (very detailed) directions to the next house and I could hear the TV from the street! We knocked loudly and an older woman answered the door wearing an oversized “World’s Best Mom” t-shirt. She had the heat cranked up and it was obvious she wanted us to stay and visit. As we talked with her, Charlie asked how she was doing today. Her face lit up and she told us “I’m wonderful! Everyday is wonderful and I’m always good. Always good no matter what!” I want to be around more people like that! As we wrapped up our route, Charlie pointed to his University of Memphis hangtag. He told me that seniors over 60 can audit classes for free at the university! His wife has taken at least 10 and this semester he’s thoroughly enjoying his History of Africa course because, among other reasons, “the professor is awesome.” Charlie’s phone rang and he answered it through his car’s speaker system (something I have yet to master). He and his friend discussed plans to visit Mister Hat and meet for lunch in Cooper Young. The more I learned about Charlie and his awesome hat, the more I liked him! I asked if I could write about him for this blog post and he asked, “What would you want to do that for?” I have always suspected that volunteering keeps you young and sharp. I’d like to submit Charlie as exhibit A. With the help of volunteers like Charlie and the awesome coordination skills of Meals on Wheels leader Rick Finkey, MIFA delivers 1,800 a day to seniors and home-bound residents in our community, but they’re short 35 slots in November. Rick told me that children are welcome to accompany their parents on deliveries and that many of the Meals on Wheels recipients consider the company of children to be as good as the food. Volunteers as young as 16 can sign up to deliver meals with a valid driver’s license, insurance, and parents’ permission. 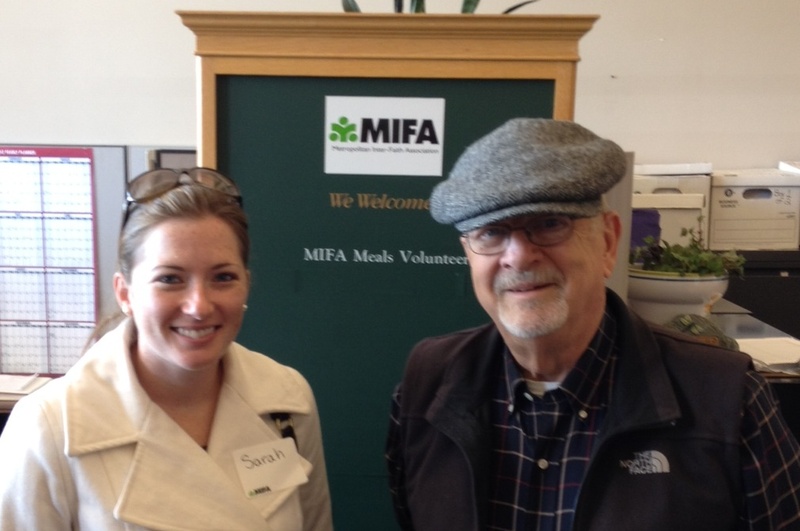 For many who receive the Meals on Wheels, the MIFA volunteer is their only point of human contact for the whole day. How many days could you sit in your home by yourself without seeing another person? Many are lonely and look forward to talking with the volunteers and building relationships. Some of the volunteers have been working their same route for 20 years! Sign up once and you’ll be hooked like I was! Maybe I’ll be writing about you and your awesome hat 20 years from now. Work as a handyman (building ramps and doing other needed tasks). Assemble a holiday hope chest. Be a senior companion. If you or someone you know is over the age of 60, with free time and some good stories, they’d make the perfect Senior Companion. Donate! You could consider making a family donation during the holidays (as my friends did) in place of traditional gifts. Big or small, your donation will be used carefully and for a great cause! Attend on of their fundraising events like the awesome Feed the Soul event each fall. Bring your kids to sensitivity training! Many people have asked me how to get their kids involved and teach them about caring for others. On December 15th, MIFA will host a sensitivity class where they teach kids about aging and disabilities. They’ll wear glasses covered in vaseline to simulate vision loss and they’ll try to accomplish tasks from a wheelchair. After their training, take them out to Meals on Wheels or a nursing home to put their new knowledge into practice. Contact Charlie Nelson at cnelson@mifa.org for information about sensitivity training. If you want to know more about volunteering, but aren’t quite ready to jump in, email me at sarah.petschonek@gmail.com. Thinking about helping is the first step! What comes after the 30 Days Mission Memphis? Volunteer Bound! I’m traveling across the country to promote volunteerism and I want to take you with me! This entry was posted in Uncategorized and tagged aging, generosity, gratitude, kids, meals on wheels, perspective, philanthropy, Santa, seniors, volunteer, volunteering, youth. Bookmark the permalink.